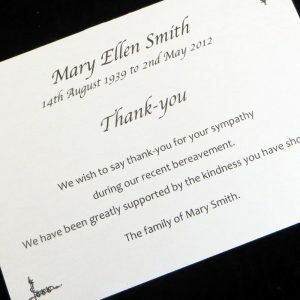 Funeral attendance cards, personalised to your requirements. 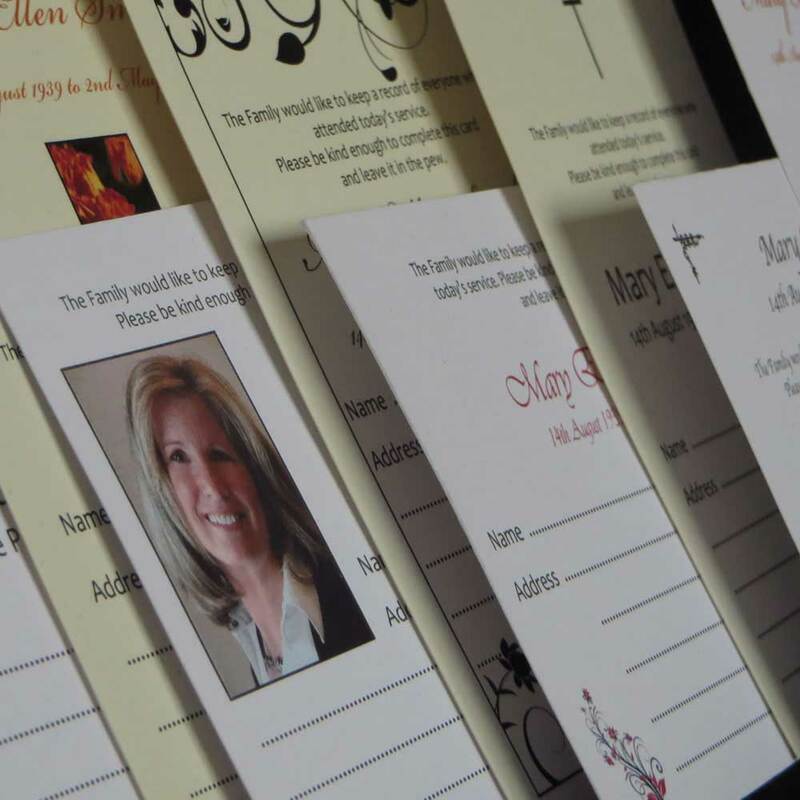 Making it easier to gather attendee's information to allow you to thank them for their support and sympathy at a later date. Free draft before you purchase. Funeral Attendance Cards FAT02 are personalised to your requirements. Simply designed in a landscape orientation with a cross in the top left corner. 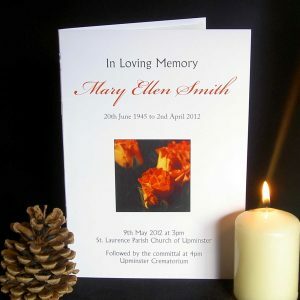 Printed on smooth white or ivory card. 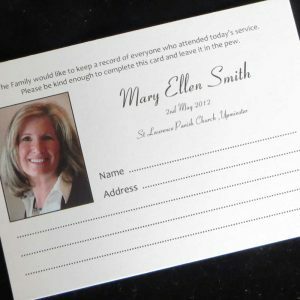 A simple way to record the names of all who attended the service making it easier to thank people at a later date. Just leave them in the pews for people to pick up or hand them out with the service books. 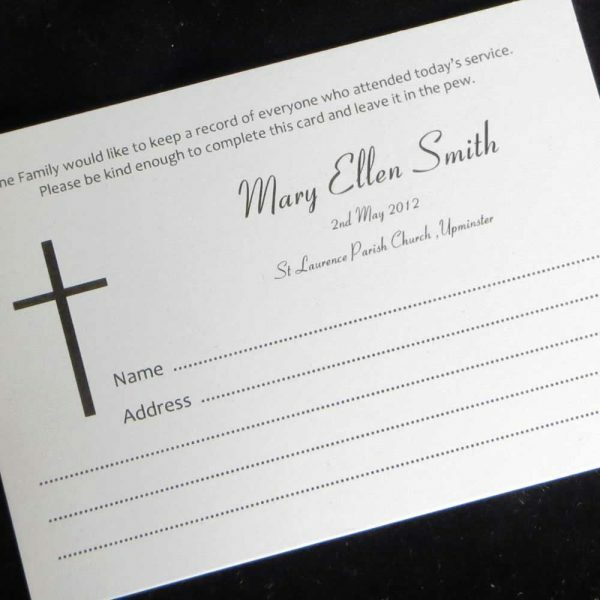 Personalised Funeral Attendance Cards FAT02 are sold in packs of 10, are securely packed for safe delivery and include free 1st class postage within the UK. An upgrade to 24hour delivery is available if required. Before printing a proof will be emailed to which you can request changes. We will not print your order until you have given us your approval. This design reference is FAT02 and you will need this to fill out your details. To send us your details please Click Here! Come back to this page to order and we will dispatch within one business day. We strive towards an excellent service for all our clients and aim to accommodate wherever possible your requirements. 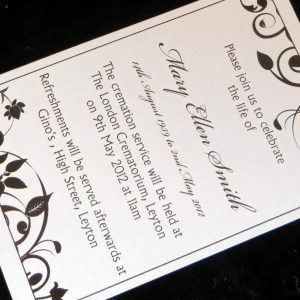 If you need your Personalised Funeral Attendance Cards immediately please contact us before you order. These are low resolution photographs and the colours may look slightly different on your computer according to your screen settings. Should you have any queries please do not hesitate to contact us quoting FAT08.